Every time a cell divides itself to create two new cells (a process called mitosis), it must first replicate its DNA into two identical copies. The way this replication is conducted means that with each cell generation, the edges of our chromosomes become slightly shorter. This is why their end parts are composed of telomeres, regions of repetitive, non-coding DNA, which our chromosomes can afford to lose without suffering any damage. For normal cells, a large number of divisions will eventually deplete the telomeres, meaning more replication cycles would damage coding DNA and result in malfunctioning proteins. This is known as the “Hayflick limit”, and is believed to occur after 50 to 70 division cycles. As it can no longer function properly, the now-« old » cell will die through a process call apoptosis (programmed cell death). 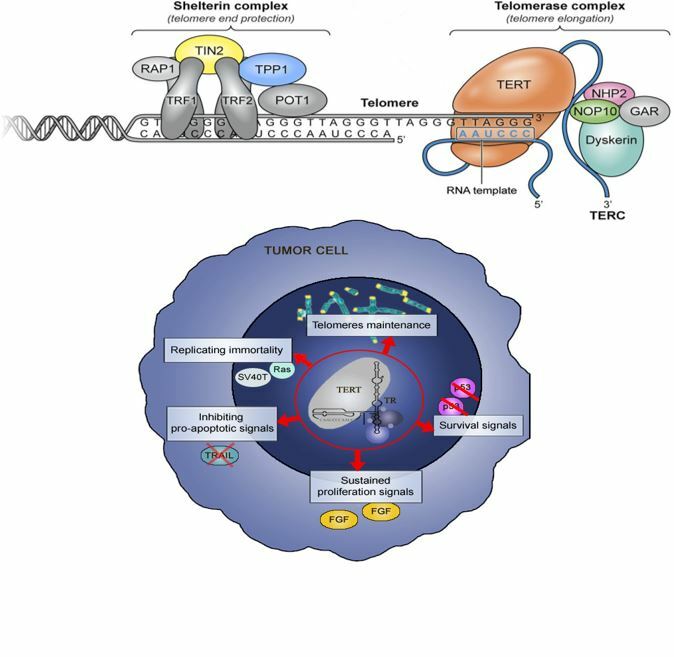 Cancer cells, on the other hand, will produce an enzyme called telomerase, or more formally human telomerase reverse transcriptase (hTERT), which adds non-coding DNA to the telomeres at the end of each replication cycle. Consequently, the telomeres never get shorter, and coding DNA is protected. This is why cancer cells are called « immortal »: they do not get older and can replicate an infinite number of times, in the proper conditions. However, hTERT inhibition induces their death. As an example, the line of human cancerous cells called HeLa cells has been used since 1951. 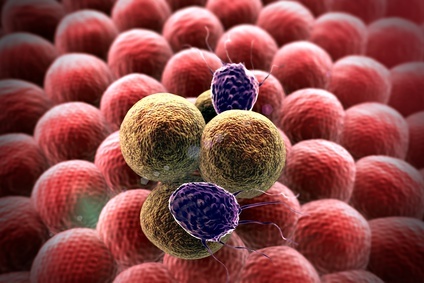 Because hTERT is almost exclusively found in tumor cells, and is critical to their survival, the immune system can be trained to recognize and kill cancerous cells without harming healthy ones. 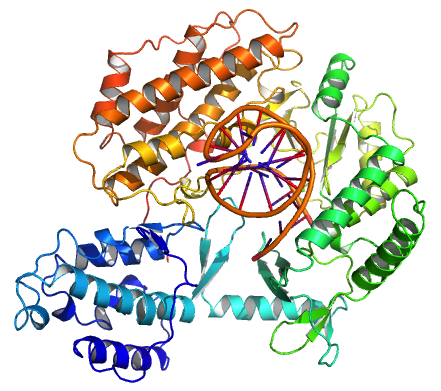 The purpose of INVAC-1 is to trigger an immune response against telomerase. The graph bellow details the way telomerase regenerates telomeres. 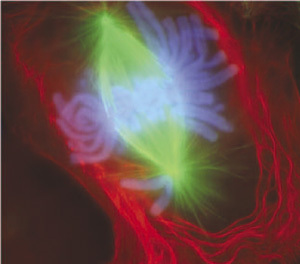 1) The telomere complex latches on to one of the DNA strands (in this graph, on the upper strand). 2) The complex adds nucleotides (the A, T, C and G bases), to the strand thanks to its RNA template (AAUCCC). Thus, the telomere nucleotides are always repeated in the same order: TTAGGG. 3) Once the telomerase complex has finished adding its repeated sequence, it leaves. 4) A second enzyme, DNA polymerase, latches on to the DNA, and completes the telomere by adding nucleotides to the second strand (in this graph, the bottom one). 5) The DNA polymerase leaves after having finished elongating the telomere.